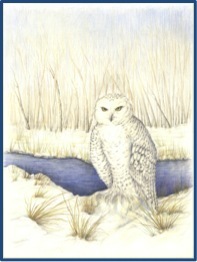 This rendering of The Snowy Owl, (Christine M. Leddy, colored pencil, 2012), was the cover my Christmas card this year. This magnificent bird migrates into New England during the winter months. Here in Connecticut, we are rarely see them. During 2011, a couple of Snowy Owls were spotted as far south as the Stratford and Norwalk shorelines. But generally, you would have to travel to Massachusetts to view them. Ironically, the largest population in the Northeast during the winter months is estimated to be at Logan Airport in Boston. Maybe it’s the runway’s resemblance to the frozen tundra where these birds prefer to call home. Unlike other owls, they are active during the day. They are drawn to open fields, coastal beaches, and marshes. Among other animals, they hunt lemmings and voles. I’m not sure I could identify either of those varieties on Nature’s food chain but the owls are welcome to them as a main course.